The last time Ken Stringfellow remembers playing in Athens was at Tasty World with the Posies in 2005. Since then, the jack of all trades has been on hyper-drive. He’s a producer, composer, writer, gun for hire… the list goes on. The next time he’ll take a break is sometime in August. Then it’s off to work again. Stringfellow is probably best known around these parts for his stint with R.E.M. but take even a slight glance at his resume and you’ll see his varied talents at work. The Disciplines, The Posies, Big Star, Snow Patrol, Minus 5, they’re all there. But take all of that and put it away. As he’ll tell you, Stringfellow’s Danzig in the Moonlight has been a long time coming. A gorgeous and varied study in modern indie pop, the album is pure Stringfellow. There’s gentle melodies, soul and blues, duets and more. Danzig is as varied and interesting as Stringfellow’s career. One does wonder how the man balances all his projects and still manage to keep material for himself. It’s a simple matter of focus, Stringfellow muses. All of that pent up emotion comes flowing forth in his solo work but it really shines onstage. With Athens being the last stop on his agenda before SXSW, Stringfellow could look back on his tour with some pride and excitement for how well it’s gone. In every city, he’s gotten a local female singer to duet with him on “Doesn’t it Remind You of Something.” Often, he’s never even met the performer and may not even get a soundcheck with her. Athens’ featured songstress is a familiar face to any and all who’ve been around town for the past few years. Let’s just say she’s got a voice for all seasons, eh? 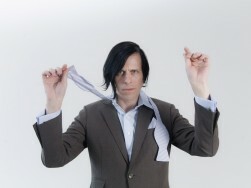 As for Ken Stringfellow, he’s got plenty of activities in the works after heading back to Texas for SXSW. Perhaps we’ll get the privilege of seeing him again soon. Next Post CONTEST: Want the Deluxe Cd Edition of GREEN?